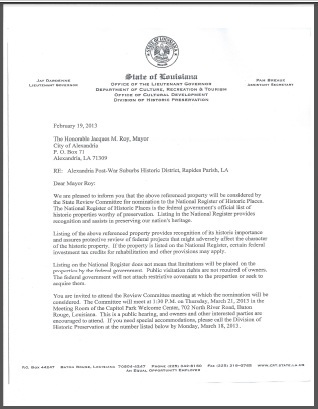 Read this letter to Mayor Roy from Pat Duncan, Assistant Secretary and State Historic Preservation Officer, formally notifying him of the state review panel's consideration of the nomination and a map showing the location of the visitors' center where the review will take place. 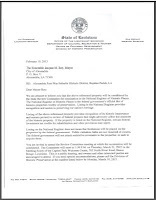 Similar letters were sent to state and federal legislative representatives. To receive email notifications of updates, enter your email address in box below, then submit and follow instructions. 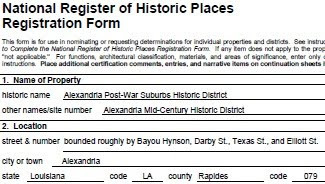 The boundaries of the Alexandria Post-War Suburbs Historic District (Rapides Parish) encompass 149 houses. Contributing elements include ranch houses and contemporary houses (far more of the former). They range in date from 1945 to 1963, except for two houses (dating from 1964 and 1968). The latter are being counted as contributing because they reflect the design ethos of the district and are almost fifty years old. The scale is one story, and almost all contributing houses are clad in brick veneer. With only a nine percent non-contributing rate and well-preserved contributing houses, the district is a strong statement from the post-war period.The nominated district is located some two miles southwest of the old downtown in an area of mature vegetation. A small stream (Bayou Hynson) defines the eastern edge. Busy MacArthur Drive, a multi-lane bypass opened in 1942, is a couple of blocks beyond the western edge.